The Lone Star State is known for producing and attracting vicious outlaws. Machine Gun Kelly, Billy the Kidd, and Clyde Barrow are just a few. These criminals terrorized civilians, inspiring both fear and awe and creating legends that would be handed down through generations. Tales of the state’s gunfights, robberies and kidnappings, heinous ne’er-do-wells, and noble lawmen bring to life a time before the West was tamed. During the wild days of Texas some of the events that occurred were stranger and more interesting than fiction. While staying at a hotel, John Wesley Hardin killed a man for snoring. Robert Clay Allison killed a looter for breaking one of his mother’s favorite pitchers. Even the lawmen of this time period were not always heroic. Henry Brown, a former deputy sheriff, took time off from his position as a city marshal in order to rob a bank and was later killed by irate citizens. Sheriff John Larn killed a half-deaf suspect who did not halt when commanded. The profiles in this reference include outlaws, gangsters, lawmen and a few Texas feudalists, Rio Grande border warriors, and Indian agitators. Also included is a chronology of well-known crimes and a locale list of notorious events. The criteria for inclusion in this book was that each outlaw had to have been involved in at least two gunfights or robberies. Laurence Yadon graduated from the University of Oklahoma College of Law and is an attorney, mediator, arbitrator, adjunct settlement judge, and lifelong student of American history with a special interest in the Southwest. Yadon resides in Tulsa, Oklahoma. Dan Anderson is a former newspaper journalist and photographer for the Daily Times in Pryor, Oklahoma. He has been honored with awards from both the Oklahoma Press Association and the Associated Press Oklahoma Northeast. He resides in Katy, Texas. Anderson and Yadon are also the authors of 100 Oklahoma Outlaws, Gangsters, and Lawmen: 1839-1939, also published by Pelican. 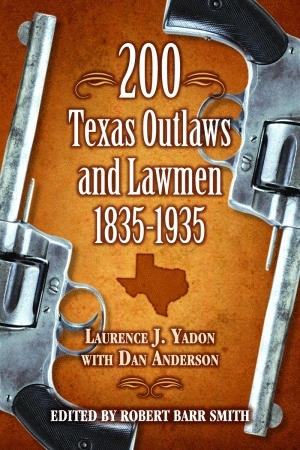 Texas author Dan Anderson and Oklahoma attorney Laurence Yadon have combined their efforts to publish 200 Texas Outlaws and Lawmen, 1835-1935. They previously teamed up on a similar book about Oklahoma outlaws. This handy volume is chock-full of basic information on gunfighters who kept the Lone Star State; with outlaw-lawman activity for one hundred years. A great reference book on the Wild West.